In the Presence of Spectators. The Death Roll - Bournemouth, Eng., July 12. "The first flying tournament of the year in England was brought to a tragic close this morning by the dramatic death of the most daring and popular British aviator, the Hon. 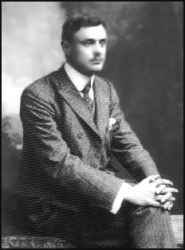 Charles S. Rolls, third son of Lord Llangattock. In the presence of a great company of spectators, a majority of whom were ladies and children and many personal friends of the young aviator, The Wright bi-plane, on which he was flying, fell suddenly with terrific speed from a height of 100 feet. It struck the ground close to the crowded grandstand, smashed into a tangled mass and before the doctors could reach the spot, Rolls was dead. The event in which Rolls was competing was for a prize for the aviator alighting nearest a given mark. The goal was directly in front of the grandstand, where the spectators were massed. He had risen to a good height, then shut off his motor and was gliding in a broad circle toward the mark. Without warning the tail piece of the bi-plane snapped off. The machine gave a sudden lurch and the framework crumpled up in the air. When it struck the ground it was smashed into splinters. The doctors found that Rolls had sustained a fractured skull. The wreck of the machine and twisted stays had surrounded the body so that there was a difficulty in extracting him. Immediately after the result of Rolls' accident was known, the committee announced that the flying would be suspended for the day. Sketch of Rolls Captain The Hon. Charles Stewart Rolls, was thirty-three years old and was one of the most popular young all-around sportsmen in england. His death will be a great blow to aristocratic sporting enthusiasts with all of whom he was a personal favorite. At ballooning, at motoring and later in the field of aviation he had distinguished hinself by his utter fearlessness and was satisfied with nothing short of record-breaking in whatever line of sport he took up. Undoubtedly his crowning feat was his round trip across the channel between Dover and Calais in a Wright bi-plane on June 2 last. Two Frenchmen, Louis Bleriot and Count DeLesseps already had crossed the channel, and Hubert Latham had almost succeeded. Channel flying was at a discount in England because it was an old story and also because national pride suffered from the monopoly of it by Frenchmen, when Rolls electrified the entire kingdom by doubling the accomplishments of his pre-decessors. The distance between Dover and Calais is twenty-one miles and when Rolls did the round trip of forty-two miles in ninety minutes without stopping, his performance was marvellous, both for distance and time. In his youth Rolls was one of the pioneers in motoring in England. He drove a motor car about while the ordinance was still in force that every self-propelled vehiche on the public roads must be proceded by a man carrying a red flag to warn pedestrians. In 1900 he won the gold medal in the thousand mile automobile race. He was the representative of Great Britain in 1905 and several times made world's records for speed. As a balloonist Rolls had made more than 150 ascensions and crossed the channel several times in balloons. Captain Rolls had expected to come to the United States this fall to give exhibitions of flying and to compete in any meeting that might be held. After his flight of the channel, he received telegrams of congratulations from King George and Queen Mary, was given the gold medal of the royal aero club, and altogether was one of the most conspicuous figures in England. September 17, Selfridge, Lieutenant Thomas E., U.S.A., killed in fall with Orville wright, near Washington. September 7, Enn, Ross I., Italian, killed in Rome, in machine of his own invention. September 7, Lefebvre, E., killed in Wright machine at Juvisy-Sur-Orge, France. September 22, Feber, Captain Louis F., killed at Bouiogne, France. December 6, Antonio Fernandez, Spaniard, killed at Niece, falling 1,000 feet after motor exploded. January 4, De Lagrange, Leon, killed at Bordeaux, France. April 2, Herbert, Lebion, instantly killed, falling on rocks at San Sebastian, Spain. May 13, Michlein, Cheavette, killed at Lyons, France. June 17, Speyer, Eugene, killed at San Francisco. June 18, Robl, killed at Stettin, Germany. July 1, Wachter, Charles, killed at Rheims, in Antoinnette, monoplane. July 8. Baroness De La Roche was almost killed by a fall in her Voisin bi-plane at the Rheims meeting." 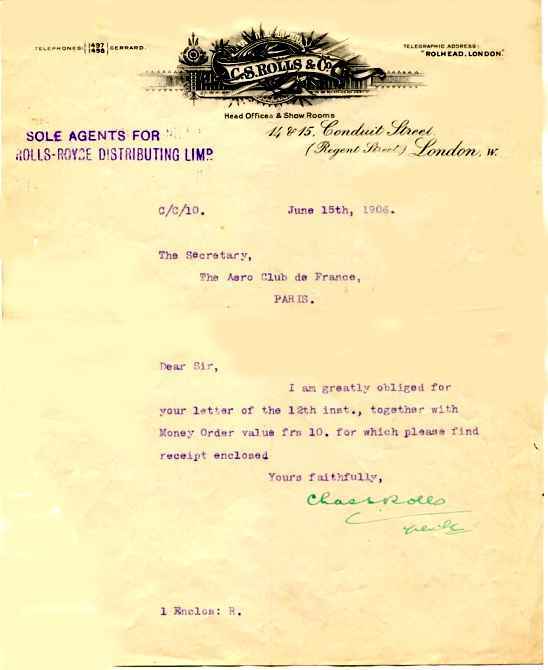 By email from Dave Lam, 1-25-03 Charles Rolls was born in London, August 27, 1877. He earned license #23, January 6, 1910, in a Rolls aircraft. in France. He died on July 12, 1910 at Bournemouth UK. Re Charlie Rolls! Actually he wasn't a Captain - never in the forces. He was VERY eccentric - had few close friends -hero worshipped from afar - hated his own class - smoked like a chimney and was a vegetarian - an incredibly complex character - brilliant mimic, banana skin sense of humour - very good with children - unbelievably mean - loved music hall - hated anything highbrow and hated snobs - especially all his mother's friends - its all in the book!! but it's a slow business getting it published! Editor's Note:I thank Helen for these notes on the character of Rolls. I look forward to reading the book which she has written on his life and is currently in the process of having it published. I will announce it when it becomes available. 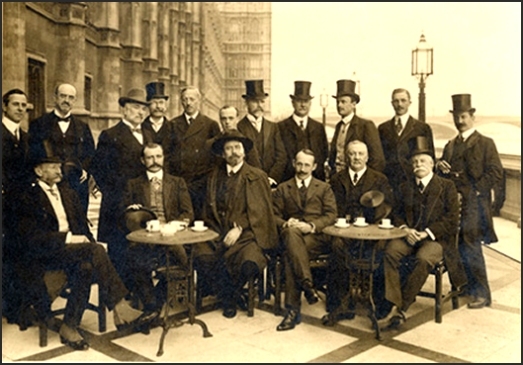 at the House of Commons, 1909. Back row, left to right: Sir Alliott Verdon-Roe, George Renwick (MP), John Martin (Daily Telegraph), Mr Robins (press), Dr Macnamara, Mr Renwick Jnr, Sir Reginald Ambrose Cave-Browne-Cave, T P O'Connor (MP), Hon Charles S Rolls, Hon William Lygon, Dr Lockyer. Front row, left to right: Edward Purkis Frost, Louis Bleriot, Samuel Cody, William Du Cros (MP), Frank Hedges Butler and Colonel Massy. Louis Bleriot (1872-1936) is probably the most well known person in this picture. He was an aviator who made the world's first over-the-ocean flight in a heavier-than-air craft in July 1909 when he crossed the English Channel in a monoplane. Also featured are: Frank Hedges Butler (1855-1928), who was a balloonist and pioneer of flying; Charles S Rolls (1877-1910), who was an engineer and aviator; and Samuel Cody (1861-1913), who was a cowboy, showman and areonautical pioneer. ONLINE RESOURCES If you search for "Charles Rolls" +aviation, using the Google search engine, (3-8-06), you will find about 432 links. Among the most helpful are the following. Charles Rolls (1877-1910), motoring and aviation pioneer This homepage on the CASGLU'R TYSLAU - GATHERING THE JEWELS website for Welsh cultural history is a "must-visit" starting point. It offers a collection of 15 wonderful photographs, each with explanations, which document and expand the story of his life and career. You can begin enjoying the photos by clicking on the link, "Exploring the Theme." You can access the website by clicking on the title above. The Hon. Charles Stewart Rolls (1877 - 1910) This page on Russell Naughton's "The Pioneers" website is perhaps the best place to start your search for more information. It offers very helpful summaries of many websites, most with illustrations, as well as links to other sites of importance. You can access the site by clicking on the title above. If time permits, I suggest that you visit the homepage of the website and sample some of the many other fine resources. 100 Years After First Rolls-Royce Meeting This website was suggested to me by my friend Roy Nagl. On it you will find a brief history of Charles Rolls in this article from the Monmouth Museum. The announcement of the commemorative set of rare photographs called, "The Hon. C.S. Rolls 1877-1910: An Extraordinary Life" is especially exciting. It would appear to be an important contact point for anyone wanting more information about his life and career. You can access the site by clicking on the title above. Charles Rolls was killed in an accident in 1910. Contributed by Lannie Liggera, 7-5-09 "His death," says Robert Loraine, "was another occasion for a half-mad outburst of obstructionist sermons. 'This splendid young man has thrown his life away,'said anti=aviationists. They seemed to be oblivious of the fact that the cause for which he had died was as great and noble as anay that had claimed its troll of lives down the ages. There had been no terror for Chareles Rolls in his passing. His face, as I saw him lying in his wreckage, a moment after the fall, showed nothing but a calm content."